A saucepan is going to be the most used piece of cookware you own. It gets used for just about anything from sauces to mac n cheese to boiling eggs and vegetables. So, there is no wonder why you would want the best saucepan that money can buy considering how often it will get used. You don’t want to have to resort to using your wok or skillet for making a luscious sauce at home when you could be using the best saucepan. Knowing what essential cookware is needed in the kitchen will determine how good of a chef you are and how well your dishes stand out. Saucepans come in all different sizes and styles. Each style is usually for something specific like double boiling, boiling or straining. But in the long run, they are all usually the same in the sense of what their primary use is for. You could go out and buy a whole set of saucepans of different sizes but in time, if it is not a high-quality pot, then most likely it will need to be replaced. In this article, we will go over some of the features to look for when purchasing a new saucepan as well as go over the construction and design of most models. We will also cover some of the saucepans available for purchase on the market today. Since there are so many different types of saucepans, you will need to determine what your saucepot will be used for or what you want to accomplish with the saucepan. Also, check to see if you need a saucepan that falls under the category of induction cookware. Not all saucepans will work on an induction cooktop. Knowing what induction cookware is and how it works will help you to find out if you fall under this category as well. Once you know this then you will be able to tell if you need a more job-specific saucepan rather than the average pot. Once you know the type of saucepan you will want, you need to know how big you will need it to be. Saucepans come in many different sizes ranging from 1 cup to 3 gallons. If you don’t plan on making a lot each time then a smaller 1- or 2-quart saucepan will do just fine. No sense in buying the largest size if it will never be utilized properly plus it will take up so much space. However, some saucepans have the ability to double as sauté pans depending on their size. Once you know the size then you will want to make sure the saucepan is made of quality materials that will not deteriorate over time or rust and break. Look to see if some saucepans come with extra accessories like lids, strainers, separators and double boiler sets. These are all extra added bonuses. Make sure you are comfortable handling the pot and that it is safe and easy to use. Try not to spend too much money on an elaborate pan that may not even do as much as a cheaper one does. Price does not determine the quality of the saucepan. Also try to buy a saucepan that is covered by a warranty to protect it from any damages or defects that may occur while in use. There are many different types of materials your saucepan could be made out of. Each material will determine how the pot acts and gets hot. It will determine if the heat will be evenly distributed across the pot or if there will be hot spots. It will also determine if the saucepan qualifies as induction cookware too. Most copper bottom or aluminum pots will not work on an induction cooktop. The saucepan needs to be constructed of high-quality materials but also needs to be well constructed with the user in mind. Is the saucepan comfortable to use and easy to maneuver? Heat resistant handles are almost necessary. Is the saucepan able to be placed in the oven and if so at what temperature? These are good questions to ask yourself when choosing a new saucepan. Do you want the saucepan to be able to cook like other pans like a wok, sauté pan or skillets? Then you need to make sure the saucepan is more than 2 ply cast iron clad at least to retain that amount of heat on the bottom constantly without burning. Some saucepans just cannot double as sauté pans due to their construction. Having a saucepan that is easy to clean and preferably dishwasher safe will always be a bonus. For the most part, saucepans look alike. Some may have a better finish or shine brighter with chrome plating or stainless steel. All copper pots are highly sought after because of their rustic look to place on display. The first saucepan on the list is most likely the best one. This saucepan does not come cheap though. It will cost you about $150 but that doesn’t matter because it will be the last saucepan you will ever buy again. The saucepan is constructed of high-quality stainless steel which encompasses an aluminum core which is 3 ply. This makes the pot very durable and easily doubled as any other pan. The heat will also distribute evenly on the bottom. This pot is also compatible with any induction cooktop and is dishwasher safe making it very easy to clean. The saucepan is also polished with a starburst finish to create a stick-resistant surface. This saucepan has it all and if that wasn’t enough, the saucepan comes with a lid and is also able to be placed in the oven at temperatures of 600 degrees. This is a great saucepan but is a bit on the pricey side. But we think this will outlast any other saucepan out there. But if it doesn’t, then no worries because the saucepan comes with a lifetime warranty with the original purchase to protect it from any defects or damages that may occur while in use. This saucepan may not have all the bells and whistles like the last saucepan had but it does have some nice features. Plus, it is about a third of the cost of the last one so it is definitely worth a look. The saucepan is constructed of high-quality stainless steel with a 2-ply aluminum core that helps to distribute the heat evenly and creates induction cooktop compatibility. The saucepan comes with a lid and is oven safe even with the see-through tempered lid. The saucepan is very easy to clean and is dishwasher safe. There is not a lot bad to say about this product especially since the best feature of all is that the saucepan comes with a lifetime warranty with the original purchase that protects it from any defects or damages that may occur while in use. This would be the best choice if you are wanting a quality product and don’t want to pay a lot of money. This saucepan is only about $40 and plus it comes with a lifetime warranty with the original purchase to protect it from any damages or defects. You can’t go wrong with that deal. 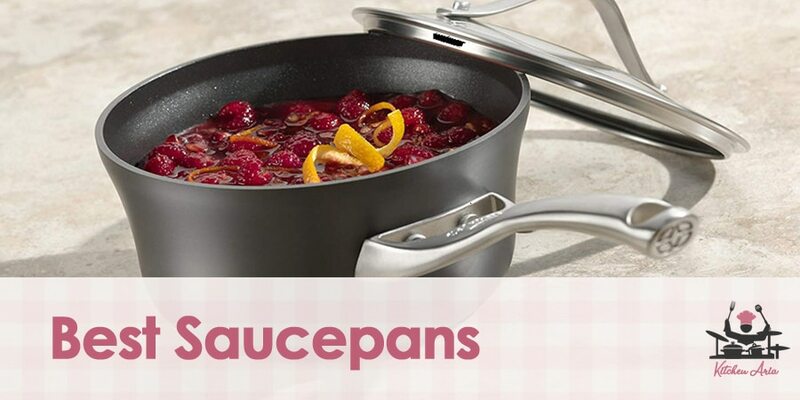 The saucepan hails from a well-known company that has been making quality products for years. They constructed the pan of 18/10 stainless steel with a single ply aluminum core to distribute heat evenly. The saucepan is dishwasher safe, oven safe, broiler safe and is also compatible with any induction cooktop burner. The saucepan also comes with a heat sensitive lid which can also be placed in the oven. This saucepan is not that bad of a deal and will get the job done if that job happens to be in the kitchen at home. It can do some of the other things the high-end models can do but just not as extreme. For instance, the saucepan is oven safe but only for temperatures up to 350degrees. The saucepan is priced very fairly and is also covered by a lifetime warranty to protect it from any defects or damages that may occur while in use. It also comes equipped with a see-through tempered lid to monitor the cooking process. The saucepan is very easy to clean and is also dishwasher safe. This beautiful saucepan comes in several different colors and is meant to be used as cookware as well as dinnerware or a serving dish. The saucepan is constructed of solid cast iron and has a long-lasting enamel exterior. Since the saucepan is made of cast iron, it will be able to retain very high temperatures easily. The saucepan can be placed in the oven with the lid with temperatures up to 900 degrees. The pan will also last forever if you take care of it properly. There is a lot of negative about this saucepan. The product is very expensive and is not protected by any warranty. The saucepan is not dishwasher safe and needs to be handwashed immediately after use and seasoned with oil before storing. It is also not compatible with an induction cooktop. This is the best saucepan for any college student in a dorm or a single person with not a lot of money to burn. The saucepan pan is great for two reasons, its cheap and its functional. The pan is constructed of thick aluminum encased in stainless steel and is equipped with a lid. The handle has a hook attached to it for easy storing. The pan is easy to clean and dishwasher safe plus it can go in the oven with temperatures of 300 degrees. To top it all off, the pan comes with a lifetime warranty to protect it from any damages or defects. The unit is very cheap and comes with a lifetime warranty to protect it from any damages or defects that may occur while in use. The saucepan is dishwasher safe and oven safe at temperatures up to 300 degrees. The pan is not compatible with an induction cooktop burner. The pan can sometimes leave a metallic taste from the thick aluminum. This pan is a little bit on the pricier side of most saucepans but it is non-stick and it also comes with a lifetime warranty to protect it from any damages or defects that may occur while in use. The saucepan is constructed on solid aluminum to help evenly distribute heat on the bottom but it is not compatible with induction cooktop burners. The inside of the pan is double coated with heavy Teflon to provide a slick surface. The pan is also very easy to clean and is also dishwasher safe. This saucepan is almost identical to another we have already reviewed except for a couple differences. The pan is constructed of 18/10 stainless steel wrapped around an aluminum core to help evenly distribute heat and make compatibility with induction cooktop burners possible. The saucepan is oven safe, broiler safe and also dishwasher safe. It is also priced the same as the other one for about $40. The difference is this one is twice the size and it does not come with a warranty to protect it from damages. This non-stick saucepan is a lot like the other we reviewed except this one is much cheaper, a little larger and does not come with any kind of warranty protection. The pan is constructed of adonized aluminum which makes the heat distribute evenly but is not compatible with any induction cooktop burners. The pan is oven safe, broiler safe and also dishwasher safe. The handle is equipped with slip resistant grips and comes with a lid that is slotted for easy straining. The lip of the pot also is indented so you are able to pour fluids without spilling. Constructed of high quality adonized aluminum to provide even heat distribution throughout the pan. The pan is broiler safe, oven safe and dishwasher safe. The lip of the pan has a pour spout for easy pouring without a mess. Does not comes with any kind of warranty to protect it from damages or defects that may occur while in use. Is not compatible with induction cooktop burners. No matter what saucepan you decide to go with at least make sure it is reliable. Make sure you are comfortable using the product as well. There is no point in buying something you don’t know how to use or are unable to use. Also, remember if you are using induction burners make sure your saucepan falls under the induction cookware category. Get out and buy the best saucepan now so you can start cooking!